Astrophysicists have discovered that they can’t account for the composition and behavior of the universe without including “dark matter”—matter that can’t be observed directly. New calculations show that only around 15 percent of the matter in the cosmos can be observed through today’s telescopes or other electromagnetic instruments. There’s a parallel situation in finance. One segment of the financial universe—also around 15 percent—is more easily observed and readily measured than the rest of it, and thus tends to draw more attention. It’s sometimes even viewed as an indicator for the capital markets as a whole. This observable financial “matter” is the regulated fund industry—U.S. mutual funds, exchange-traded funds, closed-end funds, and unit investment trusts, as well as similar funds offered in other jurisdictions. It’s not that the rest of the financial universe can’t be observed; it’s just that these other players are harder to measure and thus often overlooked, despite their dominant role in markets. Even regulators have exhibited this tendency—as seen in the Financial Stability Board’s consultation on investment funds, which effectively singled out 14 U.S.-regulated funds as the focus of systemic risk discussion in asset management. 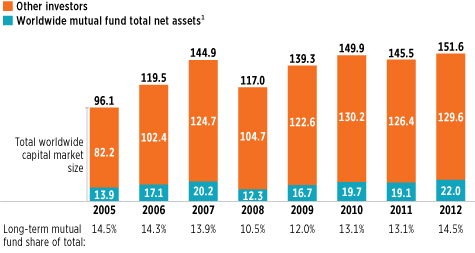 Globally, long-term mutual funds held just 14.5 percent of the market value of stocks and bonds at year-end 2012, a share that hasn’t varied significantly since 2005 (Figure 1). The other 85 percent is held by mostly institutional entities—including central banks, sovereign wealth funds, endowments and trusts, defined benefit pension plans, banks, insurance companies, hedge funds, and broker-dealers—as well as some retail investors with individual stocks and bonds. 1Worldwide mutual fund total net assets include open-end fund assets, and for non-U.S. countries may also include exchange-traded fund (ETF) assets. Note: Funds of funds are not included except for France, Italy, and Luxembourg. What about the markets in the United States? 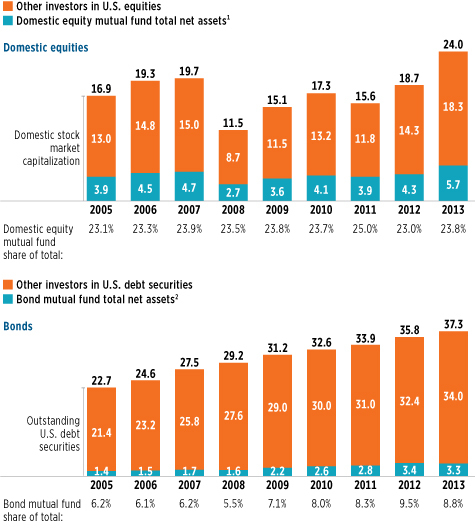 The story holds true there as well—as Figure 2 shows, U.S. domestic equity mutual funds (U.S.-registered mutual funds that invest primarily in U.S. equities) held 23.8 percent of U.S. stock market capitalization at year-end 2013, and U.S. bond mutual funds held just 8.8 percent of all outstanding U.S. debt securities. 1Domestic equity mutual fund total net assets include assets of U.S.-registered open-end mutual funds whose investment objectives are to invest primarily in U.S. equities. 2Bond mutual fund total net assets include assets of U.S.-registered open-end mutual funds whose investment objectives are to invest primarily in debt securities. Note: Data exclude assets in ETFs and money market funds. Components may not add to the totals because of rounding. If mutual funds’ share of assets in U.S. capital markets is not particularly large, their share of trading volume is even smaller (Figure 3). 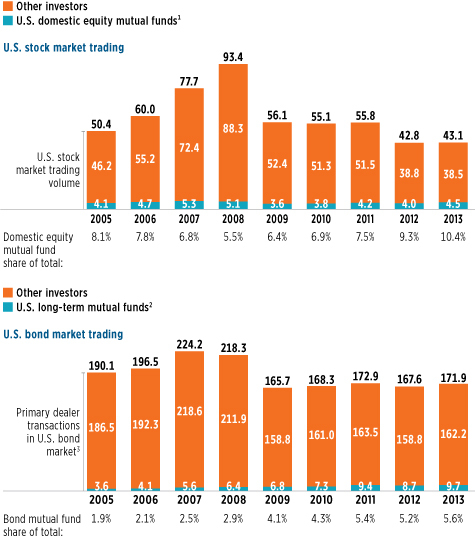 U.S. domestic equity mutual funds accounted for only 10.4 percent of trading in the U.S. stock market in 2013, while U.S. mutual funds made up an estimated 5.6 percent of trading in the U.S. bond market. 1U.S. domestic equity mutual fund trades include gross portfolio purchases and sales of common stock by U.S.-registered open-end mutual funds whose investment objectives are to invest primarily in U.S. equities. 2U.S. long-term mutual fund trades include gross portfolio purchases and sales of debt securities. 3Transactions with counterparties other than inter-dealer brokers. Note: Data exclude portfolio purchases and sales of ETFs and money market funds. Components may not add to the totals because of rounding. There’s a better approach that recognizes the role played by all capital markets participants, lighted and dark. Regulators charged with reducing systemic risk should take an activity-based approach—focusing on activities and practices that occur across the entire universe of financial markets—rather than singling out particular sectors or firms for designation as “systemically important.” Under an activity-based approach, regulators address any risks that they perceive with solutions that apply to all players in the markets and that relate directly to the identified activities. For activities involving the capital markets, regulators with relevant experience and expertise—such as the U.S. Securities and Exchange Commission (SEC)—should drive the process, identifying issues and considering appropriate solutions. Under this process, regulators would adhere to standard rulemaking procedures, including public meetings (with advance notice and reporting after), opportunities for the public to comment on proposals, and requirements to apply rigorous cost-benefit analysis. Regulators’ rulemaking authority was substantial before the financial crisis, and was further strengthened by the Dodd-Frank Act. SEC Chair Mary Jo White confirmed at an April 2014 congressional hearing that the commission has all the authority it needs to regulate the asset management industry adequately. Supervision of asset managers by banking regulators—whose approach is to address concerns about capital markets through bank-like regulations—is neither necessary nor constructive. U.S. mutual funds are highly transparent and easy to track because of regulatory disclosure and because a number of organizations—including ICI—gather and publish data on fund assets, flows, portfolio holdings, returns, and much more. These funds have opened up the capital markets for more than 95 million Americans and created an investment culture that lets workers and savers reap the benefits of owning shares in businesses across the world. But the downside to success and transparency may be attention out of proportion to potential risks. Capital markets have long played a critical role in helping economies grow. Numerous types of players—and innumerable types of activities—have a place in these markets, and mutual funds are just one type. Any search for systemic risk must take that diversity into account. Paul Schott Stevens has served as president and CEO of the Investment Company Institute since 2004. A recent “Heard on the Street” column in the Wall Street Journal (“Heeding 1994's Bond-Market Lesson,” July 27, 2014) is correct in saying that there’s a lesson to be learned from the 1994 bond market—but it draws the wrong lesson. The following was written by ICI’s chief economist, Brian Reid, and published on FT Alphaville on July 23. For more information on ICI’s views and research on financial stability, please visit our Financial Stability Resource Center. As we discussed in March and April, European banks have generally become less willing to borrow from U.S. money market funds due to regulatory pressures, especially at the end of the quarter. Specifically, the new Basel III requirements seek to increase capital ratios of banks and explicitly limit how much banks fund their operations through short-term borrowing (which includes short-term securities banks issue that money market funds invest in). This quarter-end effect was particularly strong at the end of June as European bank regulators continued to monitor bank progress toward meeting the new Basel III requirements, which will be fully phased in over the next few years. Since the individual retirement account (IRA) was created as part of the Employee Retirement Income Security Act of 1974 (ERISA), it has become a resounding success, accounting for the largest pool of assets in the U.S. retirement market. By the end of 2013, Americans held $6.5 trillion in IRAs, with 45 percent of that total—$3.0 trillion—invested in mutual funds.